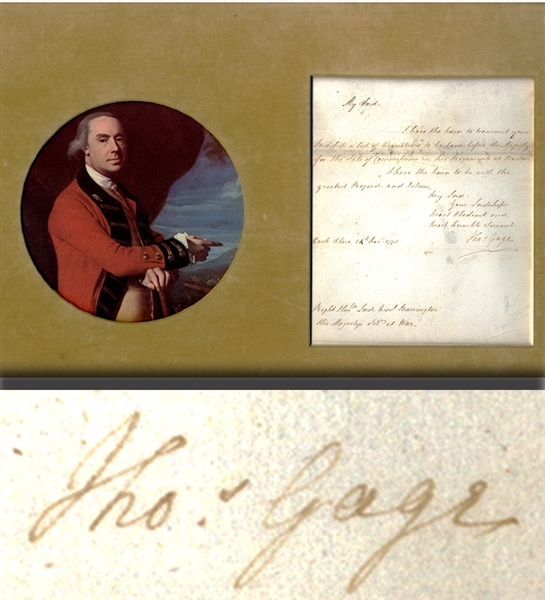 GAGE, Thomas (1718-1787) was a British Army general officer and colonial official best known for his many years of service in North America, including his role as British commander-in-chief in the early days of the American Revolution. Manuscript Letter Signed “Thos. Gage” 1pp. quarto, November 24, 1775, Park Place, addressed to Lord Barrington, His Majesty’s Secretary at War and reads in part: “...I have the honor to ransmit your Lordship a list of Promotions to be laid before His Majesty for the Sale of Commission in his Regiments at Boston...” Fine condition.